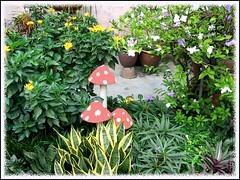 March 2008 in our garden! 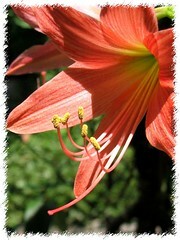 The garden month of March has been quite eventful. 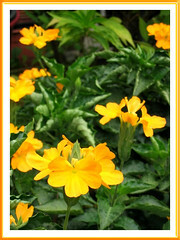 With a sunny and hot season, and some rainy days especially during the Holy Week leading to Easter Sunday, these sun-loving flowering plants simply love it and dance happily in our tropical garden. The fabulous bushes of the Mussaenda cultivars, Mussaenda philippica aurorae and Mussaenda erythrophylla ‘Ashanti Blood’ that are year-round bloomers, continue to splash their gorgeous clusters of white and red bracts. Not to be outdone are the ‘everlasting’ autumn colors of Codiaeum variegatum cultivars ‘Picasso’s Paintbrush’ and ‘Ann Rutherford’. 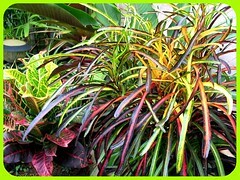 Their colorful foliage spin magically in full sun! 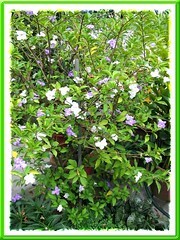 Brunfelsia calycina also shouts loudly with its tricolor flower display in the outer garden border that it shares with low clump-forming plants, such as Variegated Oyster Plant, Sansevieria trifasciata ‘Golden Hahnii’ and Ruellia brittoniana ‘Katie’, to name a few. 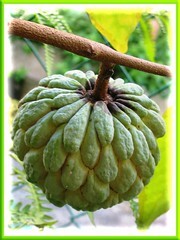 Commonly known as Yesterday-today-tomorrow, this wonderful bush perfumes the whole garden area whenever in bloom! 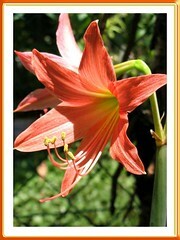 It is the first time that this lovely young bush had stunned us with so many flowers at any one time. Probably, it’s happy after receiving a haircut and this is its way of thanking me! 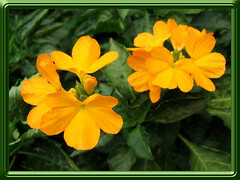 And, this beautiful shrub with deep green foliage and contrasting rich, deep-yellow flowers did more than that! 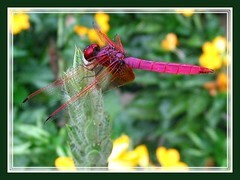 It attracted an awesome-looking crimson-pink dragonfly, Trithemis aurora, to our garden paradise recently. How exciting! 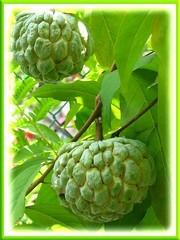 Another March delight were fruits to savour from the Annona Squamosa (Custard/Sugar Apple) tree at our backyard. How delightful! All in all, March was just perfect. We’re immensely happy and contented! Thank you, Heavenly Father, for such endless joys!